From the pen of Simon Verity: Is Bruce Ratner going to get the Brooklyn Heights Library? Maybe. Why would Citizens Defending Libraries, a group that has mobilized to fight the sale of New York City libraries and the underfunding and shrinkage of the library system (including with a petition) post a clip of mayoral candidates discussing, at an April 3, 2013 mayoral forum, the subject of what to do about the unsatisfactory conduct of Forest City Ratner with respect to its development of Atlantic Yards? The answer is easy and should be fairly obvious. In a bit we’ll return to the ramifications for libraries that relate to the difficulty of dealing with Forest City Ratner vis-à-vis Atlantic Yards, but first let’s review what happened at the mayoral forum held at St. Francis College April 3rd by the Brooklyn Reform Coalition. Atlantic Yards Report covered it here: Thursday, April 04, 2013, At mayoral forum for Democrats, Liu blasts Atlantic Yards; no candidates understand Community Benefits Agreement. Forest City Ratner signed a Community Benefits Agreement promising jobs and housing at the Atlantic Yards site. Now that the organizations that signed the CBA no longer exist, the community has no representatives at the table. What are you going to do as mayor to make sure that these promises are kept? The answers of all of the candidates acknowledge that there is a serious problem with Forest City Ratner not fulfilling its obligations and promises to the public. I think the combined answers of all of the candidates indicate that if the elected officials and politicians in this city were less financially beholden to real estate developers in general, and to Forest City Ratner in particular, the question of what to do about the giant problem of Atlantic Yards would be relatively easy to solve. The solution? : Elected officials, not taking money from Forest City Ratner and not beholden to Ratner, should get tough with Ratner, cut off subsidy to Ratner and take the mega-monopoly away from Ratner to divide it up amongst multiple developers. As it was, the question asked did not express as fully as possible the severity of the problems to be solved, but for it to do so would have been a challenge when the questions were supposed to take about only 20 seconds to read. Similarly the candidates were limited to a one-minute answer, so perhaps it is appropriate that their answers have to be consolidated to arrive at a true and complete solution. • Development in Brooklyn outside the perimeter of the Atlantic Yards monopoly has proceeded at a far healthier, faster pace than within it as was testified to by the Pratt Institute at a recent public hearing on the subject of redoing the original inadquet environmental impact statement and whether Forest City Ratner should be allowed a substantial extension of time to build the project, 25 years instead of the original ten. The real amount of time that turns into may actually be on the order of 40 years that was the estimate of a former ESDC head supervising Atlantic Yards. The logical alternative to this extension of time, considered at the hearing, is to take Atlantic Yards away from Forest City Ratner and bid it out in parcels to multiple developers. • The Fifth Avenue Committee testified at that same hearing about how the mega-project’s delays are decreasing its likely eventual level of affordability. 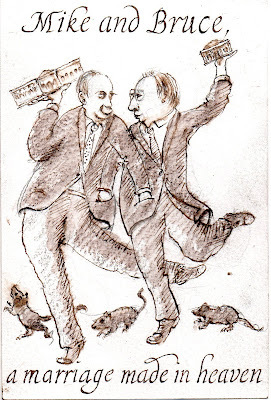 • The difficulty of negotiating the delivery of public benefit from the project is not exclusively related to the evaporation of some of the astroturf organizations that signed the so-called CBA (“Community Benefits Agreement”) so that they are not now around to enforce it: More important is the fact that government is in a weak position to negotiate with the government-created Ratner monopoly because it is a monopoly. 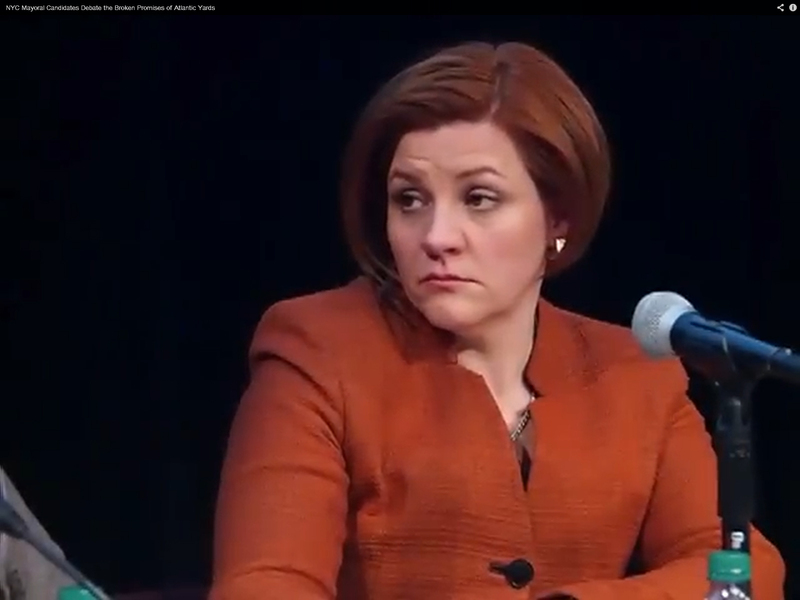 The first thing to note about the candidates' responses in the video is the visual of Christine Quinn’s response of seemingly deep displeasure that the question is being asked at all (still frame below). (Quinn is normally adept at smiling pleasantly when challenged.) Quinn, as Bloomberg’s enforcer at the City Council, stands out amongst the candidates as being most responsible for Atlantic Yards going forward and receiving deep city subsidies. Something else to note and explain is the reaction of audience measured mainly by the volume of its applause. Notwithstanding that there were good points being made across the candidate spectrum, not every candidate succeeds in getting an enthusiastic reaction from the crowd with them. The question itself gets enthusiastic applause. Liu gets the most enthusiastic reaction. Albanese gets a good reaction talking about the evils of developers' campaign contributions (as does Quinn when mentioning campaign contribution reform). There is little such enthusiasm for the expression of the other points however valid. This can probably be explained by the knowledgeability of the crowd respecting the subject and their familiarity with what candidates like Quinn, de Blasio and Thompson have not done to take on Forest City Ratner in the past. Here is what the candidates said were the solutions, in the order of their responses. . . .
Sal Albanese’s answer was that candidates for public office should not be taking money from developers like Ratner. The Atlantic Yards Report article on the forum characterized this as `changing the subject,’ but it is not. It is the core of the problem when our officials in city office get into those positions by taking money from developers. And it is a vicious cycle when elected officials dispense real estate subsidy and benefits and that subsidy then comes back in the form of political contributions. Albanese pointed out that Christine Quinn has taken over $1 million in contributions from developers, and Bill de Blasio, the runner-up in that category, has taken in the hundreds of thousands. 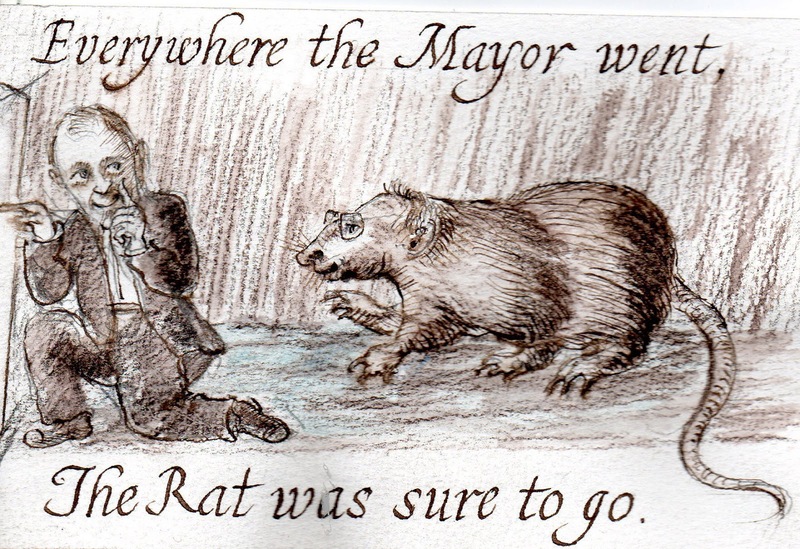 In fact, Forest City Ratner held an important fundraiser for de Blasio. Quinn’s response was the least coherent of the candidates and it did not necessarily sound as if she wanted to be entirely clear about what she was saying. She referred, perhaps euphemistically, to the “unique problem Forest City Ratner had” with the CBA signers “where the groups don't exist anymore” eliding the way in which these astroturf groups never represented the community to begin with and were formed so as to minimize any benefit that the developer might have to agree to provide. . . .elected officials must continue "to focus on what was committed to, being in the room... to get reports on where things are happening, and to be very clear and transparent on where things are at... hands-on follow-up." However, neither she nor anyone else at the table has said a word about the failure to hire an Independent Compliance Monitor. “Clear and transparent . . .. hands-on follow-up.” It all sounds good but, as the AYR commentary indicates, Quinn has given no evidence she is for real on this. Quinn did respond to Albanese accusation about taking money from developers, saying she was proud of the campaign finance system and the way she was raising money. That might seem outrageous except that Quinn, in typical Quinn fashion, was able to spin this saying, while claiming credit, that the campaign finance system was better than it used to be and better than the situation in Albany where some are talking about using the city system as a model for improvement on the state level. Liu said with emphasis that the answer was to “turn the heat up” on what he referred to as the “so-called Atlantic Yards development project.” He also said that when the Ratner team came to his office “to explain what's so great for Brooklyn” about the mega-project, what he saw that the benefit was, was just getting “some popcorn vendors” in exchange for people “kicked out of their homes.” He asked: “After hundreds of millions in city, state, and MTA subsidies. . was it worth all that public subsidy that was surrendered. The answer, so far, is absolutely not” no matter that there is a “Barclays” arena, no matter whether anyone (even Liu himself) thinks it is beautiful. Hopefully when Liu says “so far” he would not think that the answer would be to give Forest City Ratner more subsidy to get the job done. As we’ll get to in a moment, Bill de Blasio had an interesting more specific answer on that score: turning off the subsidy spigot. But would de Blasio actually enforce this? As you look at development projects across the city . . . here's a project we're giving to ONE major developer. Sometimes it works, sometimes it doesn't. If you look at something like Battery Park City and other developments like that, where you've done staged development with multiple developers that build in good times and bad times, and you hold each of them as you move along, that's a better way of doing development. It gives communities an opportunity, it gives them a full voice. And it's not up to the organization that's no longer there to monitor and have a seat at the table. This suggestion that mega-projects like Atlantic Yards should be broken up and bid out as multiple parcels to multiple developers reprises what Thompson was saying in his mayoral campaign four years ago. The problem then, and the problem now, and one reason Thompson was not getting applause from the crowd at the forum is that Thompson has never gotten to the next obvious step and clearly and specifically said that Atlantic Yards itself should be broken up for such reorganization. That would be easy to do if Thompson, as next suggested to de Blasio vowed to use the “immense power” of the mayor to just say “no,” saying “no,” for instance, to the developer's desire to have multiple decades to complete the project rather than completing it in the originally promised ten years. Let's be real about the fact that a mayor has immense power to create discipline when it comes to the development community. And if the developers don't keep their promises to the city I don't think the legal limitations stand in our way, because I assure you the developers will be back time and time again wanting considerations from City Hall. If they don't keep their end of the bargain the answer from City Hall has to be no. So I think it is our obligation to make sure that Forest City Ratner fulfills all elements of the original agreement. The problem is that, just as de Blasio says, developers do keep coming back “time and time again” wanting more from City Hall and Forest City Ratner has been a conspicuous example of this, returning over and over again to substantially whittle away at their obligations and increase their subsidy. 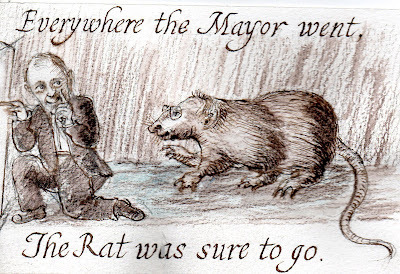 De Blasio, taking money from Forest City Ratner, has never, not during his years in the City Council when it would have mattered, nor during his now almost complete four year term as Public Advocate when it could have also made a big difference, objected to or suggested saying “no” at any one of the multiple junctures that presented such opportunities. We need that affordable housing, let's be clear, and I say this as a resident of Brownstone Brooklyn, if we don't create large amounts of new affordable housing, this neighborhood will continue to be a place for folks who have a certain level of income. It will not be the diverse place we love. It's a problem we have all over the city and as gentrification has proceeded. And gentrification is obviously a multifaceted reality; it's not all good it's not all bad. But when reality is that we end up with an economically less diverse community, which is why we must make sure that affordable housing is built at that site. Not mentioned by de Blasio was how Ratner’s Atlantic Yards activity destroyed existing, newly created housing built by completing developers, destroyed affordable housing without so far creating any, and destroyed affordable housing that under the plan it won’t replace. Mr. de Blasio failed to show any of the skepticism about the actual benefit of the mega-project shown by Liu, showed no apparent awareness of the Pratt Institute's observation that development outside the periphery of the Atlantic Yards site has been much more productive, robust and healthy than within it. His reference to Brownstone Brooklyn refers to the concern about how Atlantic Yards has been destructive to the neighborhood fabric of Brooklyn, but the reference to the neighborhood being “for folks who have a certain level of income” and then the counterpointing of this with a reference to diversity as an endorsement of the mega-project, conveys misinformation about the project’s gentrifying effects while seeming to echo the race card that Forest City Ratner played when trying to divide the community. How Many Candidates Does It take To Solve Atlantic Yards? Elected officials not taking money from Forest City Ratner should say "no" to Forest City Ratner based on failure to perform, recognize that Community Benefit Agreement and the mega-monopoly were never really set up to benefit the public, and take monopoly and the project away from Ratner to break it up into a project with multiple parcels bid out to multiple developers, using the Battery Park City model. Why is it relevant to the selling off the libraries that Forest City Ratner is not fulfilling it obligations or meeting its promises with respect to Atlantic Yards, and that elected officials are finding it difficult to find ways to get it to do so? . .
. . . One of the most important and obvious reasons is that Brooklyn Public Library officials who say they plan to sell and shrink the Brooklyn Heights Library say they are considering that they will do so by entering into a “partnership” with Forest City Ratner pursuant to which Forest City Ratner would be obligated to furnish a smaller replacement library in exchange for having handed to it the right to develop what may be a 40-story building on the site. Brooklyn Public Library officials describe the relationship as a “public/private” partnership. In actuality, we have seen this in action as the kind of developer-driven private/public partnership Forest City Ratner has notorious expertise in abusing, one of the very best examples being the Atlantic Yards mega-monopoly where the functions of government have been commandeered by the Ratner firm. The Brooklyn Heights Library property is city-owned. The library is the city’s tenant. There are certainly ample reasons to suspect that Forest City Ratner, which procured from the city the property adjacent to the library in 1988 without bid and with subsidy, will also wind up owning the city-owned library site through the partnership the BPL is saying they are considering entering into with Ratner. 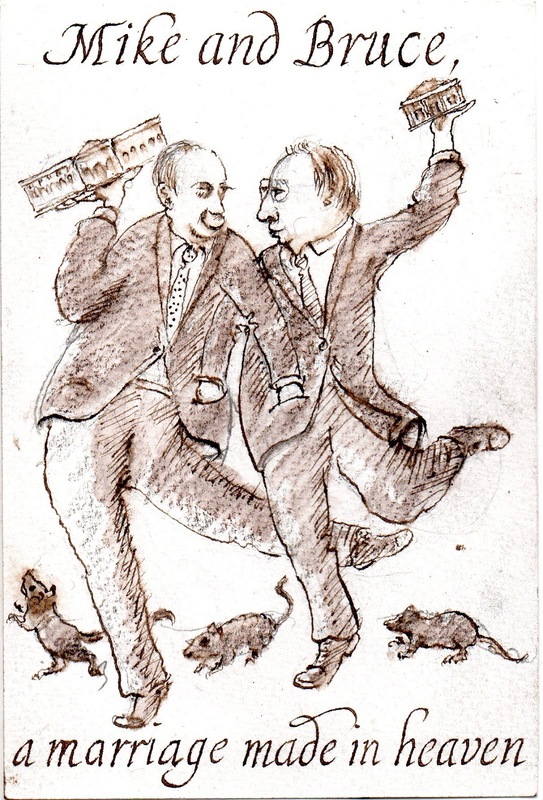 Based on what is publicly known, it cannot be said that it is definitely now known that Forest City Ratner will be the firm selected, but the mere fact that the BPL says that they would enter into such a partnership with Ratner indicates that, no matter who they enter into such a contract with, the BPL is has no true interest in having appropriately tight control of the partnership relationship so as to ensure that public benefit is achieved.. . . Otherwise, they would learn from Atlantic Yards and the discussions that were part of the mayoral forum. As representatives of Citizens Defending Libraries, Carolyn McIntyre (my wife) and I recently met with representatives of the office of Brooklyn Borough President Marty Markowitz about the sale of the Brooklyn Heights Library and were told that, like it or not, we should expect that Forest City Ratner may wind up as the developer “partner” taking over the library site. They told us that they did not see how it would even be possible to disqualify Forest City Ratner as the ultimate possible recipient of the site. It is unfortunate to think they would believe disqualification to be impossible. I explained that in my own experience as a government official involved in the selection and approval of developers it was entirely possible to disqualify developers based on prior unsatisfactory performance or conduct. In other words Markowitz’s office didn’t seem to be on the same page with de Blasio’s rhetoric in the mayoral forum that, “If they don't keep their end of the bargain the answer from City Hall has to be `no. '” And when you are saying “no” to a developer on one project you shouldn’t be thinking of handing them other projects at the same time. There is another reason you can decline to select a developer: To avoid giving the developer a monopoly or augmenting an existing monopoly. • Private/public partnerships are very difficult to manage effectively to produce maximum benefit for the public, especially if public officials are not adequately motivated to do so, which is where Mr. Albanese’s point about not taking contributions form developers has particular pertinence. Those partnerships tend to tilt irresistibly toward private benefit. 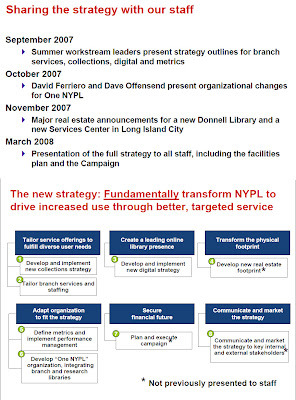 • Forest City Ratner does not seem to be especially inclined to deliver public benefit, which may account for why it seeks to put itself in the two situations of the two bullet points above. Here’s another matter relevant to libraries: It relates directly to the question the candidates were asked at the forum. In the case of Atlantic Yards, delivery of public benefit became less likely because community organizations that were supposed to be representing the community and enforcing public benefit disappeared. In fact, the problem originated and stemmed from the bigger problem that, from the get-go, the Atlantic Yards controversy swarmed with community groups that were supposed to be representing the community but didn’t really. While Quinn referred to the “unique problem Forest City Ratner had” in connection with its Atlantic Yards mega-project; that “unique problem” was a situation that was largely of Forest City Ratner’s own making because, as was seen with Atlantic Yards, part of the Forest City Ratner play book was to pave the way for its mega-project by preceding its unveiling with the creation of astroturf groups that would promote rather than oppose the project. To be clear, the term “astroturf” refers to groups or campaigns set up to give the appearance of coming from a credible, disinterested, grassroots participant but actually generated, in a masked way, by a sponsor interested in steering to a privately intended outcome. 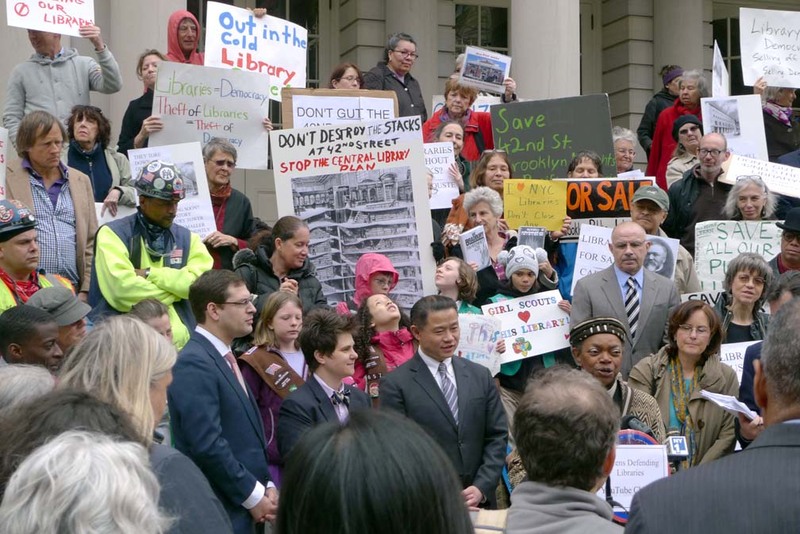 Stepping into the breach, Citizens Defending Libraries sprang up and mobilized quickly in February to oppose the Brooklyn Height library sale and shrinkage as soon as it as announced. Explanation of the Brooklyn Heights Association's implicit support for the sale and shrinkage of the library is a case unto itself, probably having much to do with the power of certain of the wealthy elite in Brooklyn Heights and the influence within such circles of David Offensend, a former president of the Brooklyn Heights Association and now as Chief Operating Officer of the NYPL, one of the key and most central figures behind the city-wide real estate deals selling off libraries going all the way back to the announcement of the Donnell Library sale in 2007. The BPL is in some respects a technically different library system, but I have been told that Offensend, talking with locals, refers approvingly to the sale of the Brooklyn Heights Library using personal possessive pronouns. But even while the position of the Brooklyn Heights Association must be examined as its own special case, the Brooklyn Heights Association takes cover by saying that it adopted its position in support of the position of the very small “Friends” group. 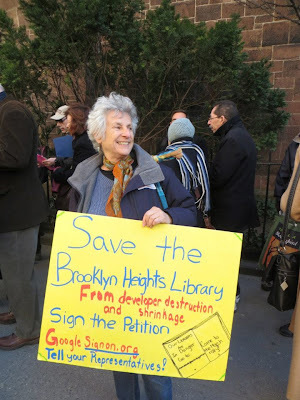 When plans for the sale and shrinkage of the Brooklyn Heights Library were first unveiled on January 29, 2013 (they had been in the works for a long time prior), the BPL chose to reveal them to the public at a “Friends” group meeting. The almost immediate condoning of the sale and shrinkage by the “Friends” group is suspicious and there is substantial indicia of an astroturfing effort involving the “Friends” group that needs to be studied. See: Saturday, April 13, 2013, Condoning The Sale and Shrinkage Of The Brooklyn Heights Library, Does The Brooklyn Heights Associations Think Of Friends Group As A Fig Leaf? It Should Think Again. If, indeed, Forest City Ratner is the developer in the wings waiting to take over the Brooklyn Heights Library site then there is all the more reason to study lessons from Atlantic Yards about Forest City Ratner’s play book of astroturf tactics. Also of Relevance: Do Public Subsidies From Atlantic Yards Flow Back To Attack The Public’s Ownership of Other Assets Like Libraries? In connection with Sal Albanese’s commentary we noted the vicious cycle that occurs when elected officials dispense real estate subsidy and benefits and that subsidy then comes back in the form of political contributions. .. . followed by more subsidy flowing out from the officials who get elected. There is another related vicious cycle to worry about. 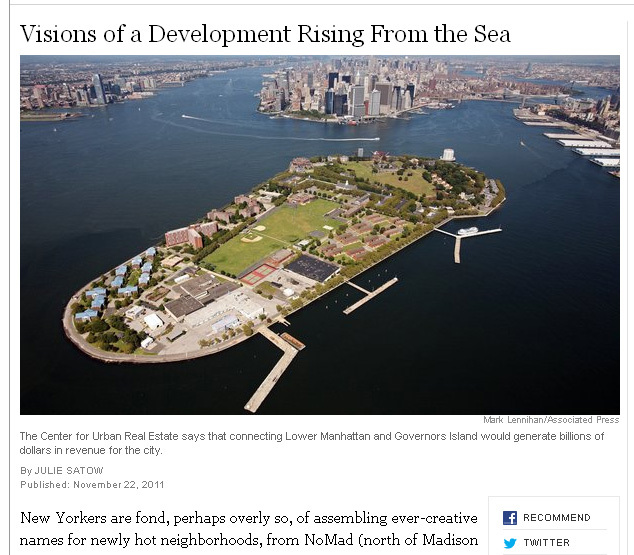 . . .
. . . As John Liu said people were “kicked out of their homes” to create Atlantic Yards. Businesses were also evicted and the city turned over public streets, sidewalks and avenues to the politically connected developer. That private property was taken through the developer’s abuse of eminent domain. In theory the abused eminent domain endowed the land turned over with public characteristics when it was given to the developer for the developer's private use. Despite all of this and copious other public subsidies, the private profit from the so-called “Barclays” arena is unrestricted: Ratner as the developer/subsidy collector owning the arena can charge any price it desires for tickets, making as much profit as possible. Where does all this unrestricted profit go? There is nothing to prevent it from going into financing and laying the groundwork for the next set of seizures whereby politicians and elected officials can steer publicly owned or controlled assets into private hands. So when we see that the Brooklyn Heights Library is under siege because its valuable real estate is craved by a developer we must ask whether profits from the “Barclays” arena are, behind the scenes, funding the attack. The same thing with the attack on Long Island College Hospital: Forest City Ratner may, or may not, be the real estate company that expects to get LICH property that the real estate industry is obviously after there but there are certainly rumors that the Ratner firm is among the sharks circling in the water with that hope. As the real estate industry seems to know no bounds to its attacks or methods this is a very dangerous vicious cycle indeed. So all of this explains why a mayoral forum discussion of the government’s difficulty getting Forest City Ratner to deliver benefit at Atlantic Yards is extremely relevant to the subject of the protection of libraries. Where do the mayoral candidates stand on the selling off of libraries, shrinkage of the library system and the intentional underfunding of the city’s increasingly used libraries as an excuse to sell them off in these special real estate deals?. . .
• John Liu and Sal Albanese have been very supportive and have each come to more than one Citizens Defending Libraries event. Comptroller Liu coordinated with CDL to hold a City Hall press conference event to decry the sale of libraries, at which Sal Albanese also spoke. • Citizens Defending Libraries met with a representative of Bill de Blasio but so far not heard back from de Blasio on his position. Twice recently de Blasio has been personally reminded while attending mayoral forums that he needs to get back to CDL. • Bill Thompson has twice been reminded while attending mayoral forums that he needs to get back to CDL. He says he will, but so far hasn’t. • At one mayoral forum Quinn gave her assurance that her staff would get back to Citizens Defending Libraries on this subject that day, but that didn’t happen. • Nothing to report on the Republican Candidates and Adolfo Carrión, about getting back to CDL. Let’s conclude by turning the question around: Based on where they are on the subject of libraries, which candidate would you predict would best and most appropriately address problematic situations like Atlantic Yards? Murphy Bed to Murphy Library? Let me explain what I mean when I say they want to build “Murphy libraries.” This is a paraphrase of what they are describing as their ambitions and the term “Murphy libraries” is my own coinage. Library officials are talking about the desirability of demolishing libraries to build smaller spaces because they talk about the advantage of replacing bigger libraries with spaces that can be more flexibly used thus making the smaller spaces more equivalent in their calculations to the original space, and, they would have you believe, more desirable than what will be lost. I myself value flexibility and creative solutions. In fact, my first major investment when I was establishing myself in a very small apartment in Brooklyn in the 1970s was a Murphy bed. I used to have fun telling people how I lived in what I called a “Murphy apartment.” It took creative flexibility to the max. Did it work? Certainty it did and I was proud of the creativity I put into using the space efficiently. This beautifully orchestrated use of space eventually came to an end: My landlord who lived in the two-bedroom apartment next to my space ended my lease and moved forward with plan to join the apartment I was renting with his own. My living room/bedroom/dining room/kitchen/office and study became just one additional bedroom in a much larger apartment. I don’t begrudge my landlord his decision to have more space. 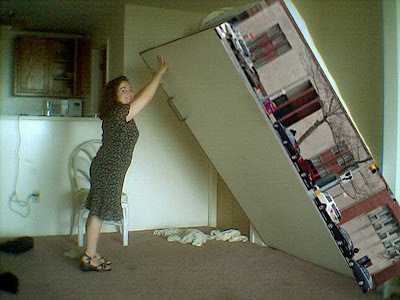 My wife and I have since that time done exactly the same thing, combining apartments (that were originally one apartment) in order to have more space. Having space is nice. It needs to be acknowledged that these combinations to create greater aggregations of space are symptomatic of other relationships in society. On the same Brooklyn Heights street where I used to inhabit my Murphy apartment a family member of mine for many years afterwards rented a one-bedroom in a townhouse that provided homes to approximately nine renting families. It was purchased by a hedge fund entrepreneur who, with his newly minted wealth (he won his bets) intends to occupy the entire building after he evicts all the long-term tenants. More space tends to be devoted to those with greater wealth and, as income disparities accentuate, a reallocation of space towards the wealthiest is likely to ensue. Most of the time I don’t know exactly how to respond to the library officials as they excitedly come up with reasons to sell libraries and shrink the system’s publicly owned assets. I find myself highly suspicious. I note that they seem to contradict themselves as they burble forth as many reasons they can think of why they should immediately put public assets in the hands of private developers. In one presentation they say that buildings should be torn down because there are not enough private places for people in the libraries to work on their résumés and that nobody should have to work on a résumé in public. In another presentation (or maybe even the same one) they talk about the need for big open rooms with sight lines so that everything going on is visible to everyone. 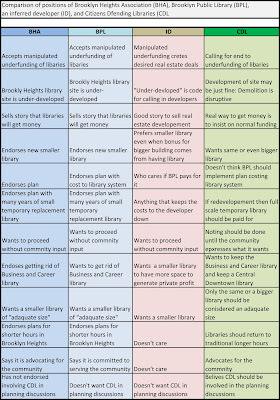 The common denominator to whatever they say is that they seem excited about reasons to sell, demolish and shrink existing assets, not work with those assets to build upon them and create a better, more robust library system in a time of city growth, increasing city wealth and greatly expanding library use. Today I was listening to a BBC report on another new kind of library being built across the country: Presidential Libraries. The report said these libraries are getting hugely bigger for several reasons: Because size connotes importance (the presidential libraries are “shrines”), because of the role that money plays in American politics and how much of it there is, and because there is more information than ever to be stored and made available to the public. If New York City’s libraries are being shrunk at a time when it would make sense for them to be getting bigger, it probably says that decision-makers view our city libraries differently: They view them as unimportant, they see and capitulate to the fact that the money in American politics is pushing to have these temples of democracy, these economic levelers, sold, and, lastly, that they consider that there is less and less information that the public actually needs to know. . . at least that's they way they view it. I still have my Murphy bed and I still have a terrific affection for everything it represents. It still folds up into the wall, but the truth is that I haven’t folded it into its cabinet in many years. It's more convenient to leave it down. It was nice to have the flexibility in my old apartment to be able to use the same space alternately for many things, but it was a lot of work. While there was flexibility in the arrangements there was a certain lack of flexibility too. One couldn’t slip away from the dinner table and retire earlier than the rest of the party. . . nor could you leave the dishes on the table to do some work at the desk between the main course and dessert. . . there was no leaving the bed unmade in the morning. You see what I mean. While flexibility has its merits in terms of generating possibilities, space itself is nice and generates possibilities too. What’s more, sometimes the formality of dedicated spaces acknowledges the importance we ascribe to certain functions and activities in life. Let's give the devil his due: The “Murphy library” is a very clever idea as a rationale for how we ought to shrink our public assets. But it may just be too clever by half! 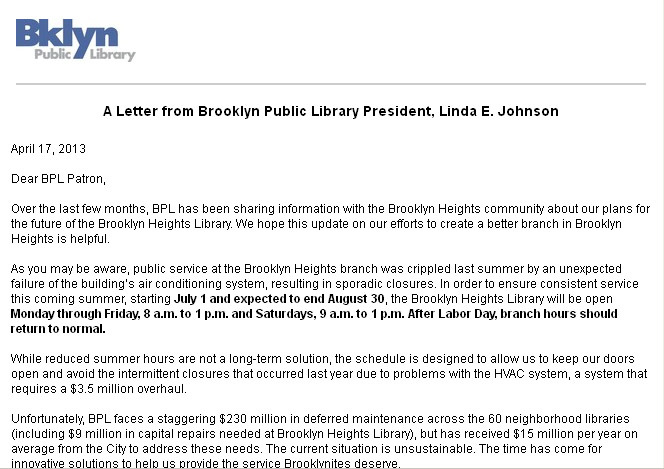 A Letter from Brooklyn Public Library President, Linda E. Johnson, April 17, 2013: Examined. What Does It Really Say? I am printing below, indented in italics, the totality of an April 17, 2013 letter that Brooklyn Public Library President, Linda E. Johnson, sent out by email to patrons of the Brooklyn Public Library about the BPL’s proposed sale and shrinkage of the Brooklyn Heights library. Interspersed with the text of that letter is analysis about why that letter should not be reassuring or placating the way it was obviously written to be. All the somewhat erratic bolding in the text of the Linda E. Johnson letter is the way that the original Linda Johnson letter, is bolded. It looks like someone added it after the fact for things they wanted to emphasize. Linda E. Johnson is the Chief Executive Officer of the Brooklyn Public Library. The day this letter was sent out to `BPL Patrons,’ April 17, 2013, was the day after a meeting of the BPL trustees. The sending of this letter was not publicly discussed at that BPL trustees' meeting (although there was an executive session supposedly about personnel matters where it could might have been discussed). For some reason, the BPL did not put this letter up on its website. Over the last few months, BPL has been sharing information with the Brooklyn Heights community about our plans for the future of the Brooklyn Heights Library. We hope this update on our efforts to create a better branch in Brooklyn Heights is helpful. “Over the last few months, BPL has been sharing information”: Not mentioned is that the BPL was not sharing information with the public about the planned sale and shrinkage of the Brooklyn Heights Library for the very long time this was in the works. This means that the for this very extended period the BPL was not sharing information the public could give no feedback or otherwise react about how this was a bad idea. Now the public’s reaction must be rushed. The BPL first started sharing information only at the end of January 2013. Sale of the Brooklyn Heights Library was planned at least as far back as October 2011 and the BPL has quietly been considering selling libraries at least as far back as the summer of 2007, approximately the same date that the New York Public Library was arranging the sale-for-shrinkage of Donnell Library in Manhattan, the previous transaction which the sale-for-shrinkage of the Brooklyn Heights Library closely resembles in many ways. As you may be aware, public service at the Brooklyn Heights branch was crippled last summer by an unexpected failure of the building’s air conditioning system, resulting in sporadic closures. The “unexpected failure of the building’s air conditioning system” occurred after the BPL decided to sell the Brooklyn Heights Library. The citing of the air conditioning as a reason to sell the library was not announced until more than a year after the decision had already been made. Virtually every time library administration officials say they want to sell libraries they cite problems with the air condition system. This includes: Sale of the Donnell, demolition of the research stacks of the 42nd Street Central Reference Library, the Pacific Street Branch, etc. In order to ensure consistent service this coming summer, starting July 1 and expected to end August 30, the Brooklyn Heights Library will be open Monday through Friday, 8 a.m. to 1 p.m. and Saturdays, 9 a.m. to 1 p.m. After Labor Day, branch hours should return to normal. The BPL announced plans cutting back on library hours amounting to a more than 50% shutdown of the library and said that they will also be “redeploying staff.” The odd hours will be an impediment to use of the library and thereby diminish and disperse the constituency for the library’s continuation. Citizens Defending Libraries believes that working air conditioning should be provided this summer and the library kept fully open. While reduced summer hours are not a long-term solution, the schedule is designed to allow us to keep our doors open and avoid the intermittent closures that occurred last year due to problems with the HVAC system, a system that requires a $3.5 million overhaul. The library is arguing that sale and shrinkage of the library is the only feasible long-term solution to the problems they say the air conditioning poses. Would you feel you needed to sell your home and move into a smaller apartment if your air conditioning went on the fritz? The idea that the air conditioning in the 1962 building, renovated in the 1990s, would cost a pretty astounding $3.5 million to fix is highly suspicious. These cited repair cost are far higher than original estimated numbers and the BPL has not been forthcoming with the furnishing of any bids upon which they could be basing this figure. Unfortunately, BPL faces a staggering $230 million in deferred maintenance across the 60 neighborhood libraries (including $9 million in capital repairs needed at Brooklyn Heights Library), but has received $15 million per year on average from the City to address these needs. The current situation is unsustainable. The time has come for innovative solutions to help us provide the service Brooklynites deserve. To address the problems at the Brooklyn Heights Library, we hope to build a new branch on the existing site on Cadman Plaza. Our project involves selling the property and working with a private developer to build a new facility as part of a larger building, at no cost to BPL or taxpayers. This says that the new library will be “no cost to BPL or taxpayers” but it doesn’t say that it will be at no cost to the public which is what there will be when publicly owned and necessary assets are sold. There will be a cost to the public when the public has to endure a significantly diminished level of library service until a new library is provided and public will also suffer detriment from the proposed shrinkage. As for there being no cost to the BPL (and implicitly to the taxpayers supporting the BPL) the BPL previously issued information that there would be cost to the BPL that it characterized as small. The method the BPL proposes of “working with a private developer” in a “public-private partnership” to build a new facility raises the specter that the BPL will likely not be receiving the best possible price for the property sold and that it will likely not be the best developer either. Most of us now think of such partnerships as developer-driven private-public partnerships where public officials defer while the developer takes over government functions. The BPL has stated that it is considering turning this development over to Forest City Ratner (which in 1988 was given the adjacent subsidized property without bid) even though the Ratner firm is notorious for abuses of such partnerships and not fulfilling promises of public benefit. • Construct a new, modern branch in Brooklyn Heights. The new neighborhood branch will still be a public facility, owned by the City and operated by BPL, as are most of our libraries. It will be comparable in size to the publicly accessible portion of the current branch and will remain one of the largest branches in BPL’s system. The Business & Career Library, currently located within the same building, will move to BPL’s Central Library on Grand Army Plaza. The “comparable in size” description is tricky. Note that with a growing city, the growing use of the library, and the redevelopment of the site bringing in money and making expanding use of the property rights associated with the site, that the library isn’t growing, or even staying the same size. Thus “comparable” becomes the operative word. But it is only comparable to some of the space, not all of the space, and only to what the BPL considers the “branch” library, not the Business and Career library that has always been a functionally integrated part of it. The BPL is decommissioning this library as a centrally located main library. • Take advantage of the value of property in the neighborhood to deliver a new branch in Brooklyn Heights without diverting funding from other parts of Brooklyn. We receive far too little money to properly maintain our buildings. This plan allows us to provide the library service Brooklyn Heights needs without taking money from other neighborhoods. The BPL has acknowledged that it is motivated to sell the most valuable of its properties first. So far that is acknowledged to mean this and the Pacific Branch library, which is also next to Forest City Ratner property and yards away from its highly subsidized “Barclays” arena. The BPL doesn’t seem to acknowledge that these are the same properties that are the most valuable to the public, the most expensive or impossible to replace with true equivalents once they are disposed of. 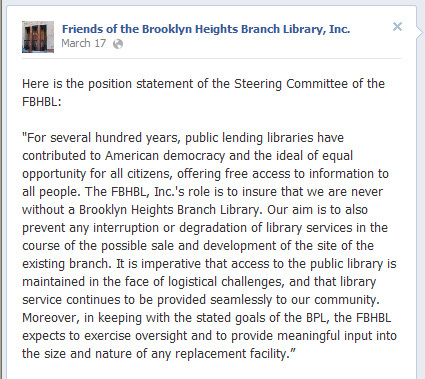 The reference that implies that the sale of libraries, particularly the Brooklyn Heights library, is somehow to avoid “taking money from other neighborhoods” is a transparent attempt to divide the public and to suggest that the public oughtn’t to be united in its opposition to this sale and shrinkage of the Brooklyn Heights library. But other libraries like the historic Pacific Street will be similarly sold. The BPL’s strategic plan says that all of its real estate is to be subject to such `leveraging’ but it is not yet fully disclosing all its plans. Incremental disclosure by the BPL serves a divide and conquer strategy and to tamp down public reaction. In actuality, no library is taking money from other libraries because the underfunding of libraries is artificial. Libraries cost a relative pittance to properly fund. What actually takes money from the libraries is the deliberate underfunding of them to generate an excuse for these sales. The shrinking of the Brooklyn Heights Library will tend to make it a library that will serve only the neighborhood of Brooklyn Heights. Right now people come from many neighborhoods to visit the library so this shrinkage is, in essence, a somewhat discriminatory eviction. The BPL recognizes that the affected communities are not buying their story and that questions have been raised about their true priorities by Citizens Defending Libraries and others. In other words the community is not excited about their plans to sell, demolish and shrink libraries. • This project is a response to the serious issues facing the Brooklyn Heights building that leverages the unique value of the building’s location. “Leverages”? : Wouldn’t it be better in such a document to abandon the Wall Street and PR speak for plain English? If there is “unique value of the building’s location” then the BPL really ought to realize and take into account something obvious and related: that the library there are selling also has a unique value to the public, not just to those they are selling it to. To reiterate, its unique value means that once sold we can never recover what was lost. • BPL is not closing the Brooklyn Heights Library. In fact, we are developing a plan to build a new, better, more modern library of comparable size to the public portion of the current branch, so that we can serve the Brooklyn Heights neighborhood for generations to come. The BPL is, in fact, planning to close the library. How long it will be closed may be speculated upon. This transaction is modeled on the 2008 closing of the Donnell Library in a sale for shrinkage deal. It is still closed and will not be reopened until at least 2015, eight long years. * “Better, more modern” is an obfuscating description for a smaller library where there will be fewer of the current resources, including fewer books, which Linda Johnson in interviews has described as old fashioned. The library will not be “comparable size” to the current library because be they will be evicting the Business and Career Library, which is an integral part of the existing library and the main system library it currently is. The BPL’s idea is that the much smaller library can be considered equivalent because they don’t need to count the reduction of whatever space they chose to attribute to these services they are evicting from this location. As for serving the “neighborhood for generations to come”: in a bigger, wealthier, growing city where the library usage is up 40% programmatically and 59% in circulation, and even more in Brooklyn, we need bigger libraries, not smaller ones. In addition, it is not just a question of choosing to insularly serve the Brooklyn Heights neighborhood alone: This library is on the Brooklyn Heights/Downtown Brooklyn business district border and is located at the borough's business most central trans hub. This library should continue to serve Brooklyn and the rest of the city and the surrounding neighborhood. The selectively narrow referencing of “Brooklyn Heights” should invite scrutiny as to what the goals here are. 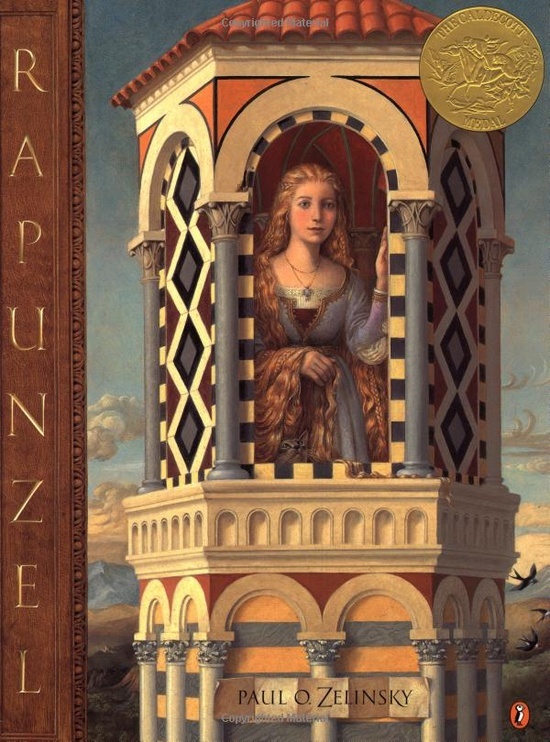 • BPL does not plan to reduce hours at the Brooklyn Heights Library beyond the summer. We will implement shortened hours for the summer, running only from July 1 - August 30, after which normal operations will resume. This seeming promise on the part of Ms. Johnson and the BPL to resume “normal operations” after August 30, should be regarded with skepticism, especially if it is being interpreted to imply that the Business and Career Library will be brought back to the Heights after August 30. The BPL has said that it intends effectively shrink the Brooklyn Heights library by evicting the Business and Career Library. (To the extent that Business and Career Library would continue to exist at all it would in some other incarnation jammed into Grand Army Plaza branch together with whatever other libraries they ultimately decide to jam in there when shrinking down the system.) The BPL’s spokeperson, Josh Nachowitz, even told one reporter that it has been their plan to do this for years. Mr. Nachowitz says that it will be redeploying staff when it does the more than 50% shutdown of the Brooklyn Heights library this summer and that the Business and Career Library’s services and programs will be relocated to Grand Army Plaza at the same time. Mr. Nachowitz said that the BPL’s plan was to bring the Business and Career programs and services back to Brooklyn Heights at the end of the summer but said that this intention was subject to what he described as “a giant asterisk,” the BPL's subsequent determination that there was sufficient funding to do so. Since claims of inadequate funding is the excuse for all of BPL’s decisions to do whatever they want in terms of the sale and shrinkage whenever they want to do it, it should not be expected that they won’t leave the library services at these lower levels. They might not even consider that they have actually resumed “normal operations” since they may be considering themselves to be speaking here only of “normal operations” for what they consider may be one half of what currently comprises the library. • BPL will not eliminate service in Brooklyn Heights at any time during the project. We will remain in the existing building until construction begins, and at that time will relocate our services and staff to a temporary space in the neighborhood. The statement that the “BPL will not eliminate service in Brooklyn Heights at any time during the project” does not mean that services won’t be significantly reduced. The existing library is currently 62,000 square feet. The BPL has talked about having an interim library of as small as 5,000 square feet for the many years the library would be off site. That hardly seems consistent with a representation that they will (or even could) “relocate our services and staff to a temporary space in the neighborhood.” Spokeman Nachowitz told the New York Times that the new library would be provided at “essentially no cost to the library system,” but this lack of service would amount to a substantial cost to the public that isn’t being taken into account. The process to develop our new Brooklyn Heights Library will be complex and take years to complete. . . The BPL would have us believe that it is not urgent to oppose sale and shrinkage of the library now. At the same time they are arguing in other circles that its plans to sell and shrink the library should not be opposed because it is a “done deal.” The BPL's plan is to have a contract that specifies that the library will be sold, exactly how much it will be shrunk and who the developer will be in the next couple of months and to execute that contract before December 31st, the last day of Bloomberg's term and before most of the public reviews.
. . . We have formed a Community Advisory Committee comprised of key community stakeholders and local elected officials who will meet regularly. We will also present the plan at other meetings, including at the Community Board 2 meeting on April 24. Please visit our Brooklyn Heights Library webpage for continued updates. The BPL itself formed the “Community Advisory Committee” ? That may be a more tellingly accurate admission than the BPL should care to admit. This “Community Advisory Committee” was formed with its principal members being something called “Friends” of the Brooklyn Heights Branch Library, Inc. and, saying they were there to support that Friends group, the Brooklyn Heights Association. Strangely, both these groups are fully acquiescent to the BPL’s sale and shrinkage plans. In a recent odd history that goes back to shortly before insider information about the sale of the library was made public, the Friends group has shrunk down to fewer than 200 members, less than half its former size. The “Community Advisory Committee” now also includes “local elected officials” partly because Citizens Defending Libraries informed elected officials about the committee and asked elected officials to invite themselves on board to monitor its activities. I will send you periodic emails about where we are in the public approval process and you can, of course, ask any of our branch librarians for more information. Additionally, you can email any questions or concerns to brooklynheightsproject@brooklynpubliclibrary.org. The Community Board 2 meeting on April 24, 2013 is open to public comment: 6:00 PM at Brooklyn Borough Hall 209 Joralemon Street. Linda Johnson does not say that branch librarians have fears about giving out accurate information about the proposal and have been told what they are to tell the public. Only if you earn their utmost confidence are they likely to tell you what they really think. Many librarians have been laid off throughout the system. The NYPL has been having laid-off librarians sign “nondisparagement agreements” saying that they will not criticize such plans in exchange for severance. We look forward to continuing to work with the community to provide Brooklyn Heights with the best possible library service. At the April 16, 2013 Brooklyn Public Library trustees meeting the chairman of the board publicly thanked certain unnamed trustees for making phone calls to the public about the plans to sell and shrink the library. Presumably these were the phone calls elected officials received telling them they should ignore the public opposition to the plan. The chairman, attorney Anthony W. Crowell, noted in that meeting that the plans had recently received a lot of press. He said that, notwithstanding, the BPL still planned to “plow ahead” with the plans as originally described to the trustees. Some individual BPL trustees are apparently uneasy with the plans. However, we noted that after the meeting many of the existing trustees told us they could not talk to us. I asked the chairman what was what with trustees talking and not talking to the public. He explained that the trustees had been told not to talk to the public until they had been subject to education sessions to get the message right. But if they don't talk to the public they can't listen to the public’s concerns. By the way: It may be that if you are a real estate developer on the BPL board of trustees you do not need one of these education sessions to be talking to the public. City Comptroller John C. Liu criticizing the plunder of the libraries at City Hall press conference last Thursday that was the culminating event of Citizens Defending Libraries Library Protection Week events. Condoning The Sale and Shrinkage Of The Brooklyn Heights Library, Does The Brooklyn Heights Associations Think Of Friends Group As A Fig Leaf? It Should Think Again. Once upon a time the Friends group was a tidy little group of neighborhood volunteers that raised funds to help support the Brooklyn Heights library. Led by its former president Diana Prizeman, it was once more than 400 members strong. Things, however, have changed. In July of 2012 the group was taken over by Deborah Hallen and the number of trustees and its membership have dwindled drastically. The group now has fewer than 200 members, which may have something to do with Hallan’s serial dismissal of many of the group’s trustees ever since she took the group over. Though Hallen has taken control of the group she is technically not the president, only its secretary, but the group’s official president, Katy Louise Miller, has absented herself from the group's activities, perhaps troubled, with good reason, by various goings on. In the fall of 2011, insiders knew that there were plans to sell the Brooklyn Heights library in a real estate deal although the public was, as yet, uniformed of this fact. 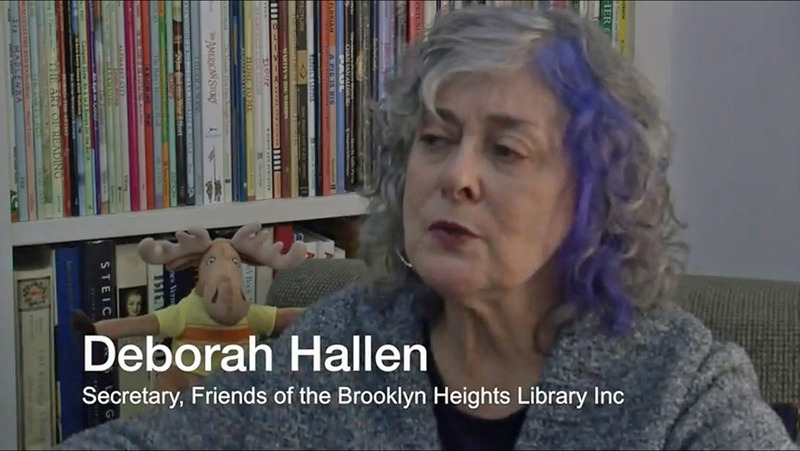 Shortly after Hallen took over the Friends group, the Brooklyn Heights library started having the reported insurmountable problems with its air conditioning system that have been cited as the Brooklyn Public Library system’s justification for selling the building. The public was not informed that the building was to be sold until January of this year. When Hallen took over the group she, by her own accounts, involved herself with lawyers and corporate housekeeping measures the exact purpose of which may be speculated upon. She also started changing the composition of the board, dismissing trustees (but not the Friends’ nominal president) for infrequent attendance. She also harshly criticized the prior administration of the group, leveling charges about faults she said she perceived. Hallen’s own administration of the group would seem to raise comparably more questions. If you are one of the Trustees who wants to tell me that we need to stop the sale, then please remove yourself as a Trustee, and we don't need to hear from you. We will accept any resignations. This was an especially strange instruction since, as is evident from the group’s Facebook page records, the trustees never met to discuss and vote on whether or not to oppose the library sale and shrinkage after the idea of it was finally disclosed to the public. The Friends group Facebook page states a position for the group about going along with the sale and shrinkage. It uses different words but coincides with the BHA’s position with such exactitude that the two statements may likely have been the subject of some very careful lawyerly review. It was posted on Facebook on Sunday March 17th, the same day the New York Times published an article supportive of the idea that city libraries and schools should be sold off to real estate developers `craving’ the properties. While the Friends Facebook posting of this position was on the 17th, the BHA posted its own position (reliant on the Friends position) on Thursday, March 14th after its board voted. Hallen, wrote in another email,“The BHA took their position after we took ours,” so apparently this public posting of the Friends position was held back for some period of time. The posted position of the Friends may not even be the position of the Friends trustees. On Facebook it is stated to be the position of the a “Steering Committee,” not the position of the Friends board. Whoever this “Steering Committee” committee is there appear to be many trustees who don’t know who it is or when such a committee was created to issue statements on behalf of the group. One trustee I talked to was even unaware that the Friends group had taken a position, even as of this last week, telling me that she was still unsure what position the Friends would take because it involved so many difficult questions that would need to be thought about. 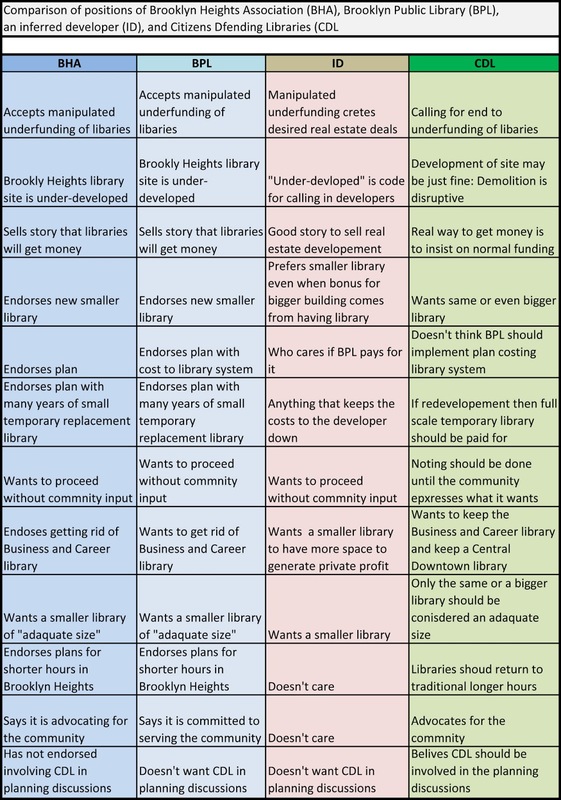 Click to enlarge: Chart from prior NNY article comparing positions of BHA, BPL, and inferred developer and Citizens Defending Libraries. The position of the Friends, though worded differently, is identical to that of the BHA. ALSO PLEASE UNDERSTAND that we are not in the position of trying to stop the sale. We are a 501(c) 3 Organization and have to adhere to our by-laws. Recall that our position is to have continuity of library service no matter what happens to the building. There is no reason why a 501(c)(3) organization, a charitable organization, could not oppose the sale or advocate for a bigger library as you might expect it to. Former Friends president Diana Prizeman said she knows of nothing in the by-laws in place when she was in change that would prevent it. It would be odd for a set of by-laws to include such a position and even odder if such a provision were inserted into the by-laws at a time when nobody except insiders knew that the library was going to be put up for sale. There are now only thirteen remaining trustees of the Friends group, including Ms. Hallen, Ms. Adler, and Ms. Miller. One thing that is interesting is that there is a concentration of these trustees that are associated with close-together Monroe Place addresses. Monroe Place is the one block long Brooklyn Heights street where Ms. Hallen lives. Ms. Hallen and at least two other trustees live at the same Monroe Place. At least one other trustee lives on Monroe Place at a Monroe Place address that is just one digit different. According to public records another of trustee’s phone numbers has been associated with another nearby Monroe Place address. What makes all of this even more interesting is that Ms. Hallen’s Monroe Place address is almost directly across the street from Monroe Place brownstone townhouse of David G. Offensend. . .
. . . David Offensend is a very important figure when it comes to libraries and their selling off. Mr. Offensend left Wall Street to go to work for New York Public Library in 2004 and, according to NYPL documents and other accounts, is the individual who is perhaps most significantly responsible for the secretive sale-for-shrinkage of Manhattan’s beloved Donnell library, which stood across the street from MOMA. That sale of that library was suddenly announced to the public in November of 2007. Mr. Offensend is also significantly responsible for the consolidating shrinkage of the NYPL Central Library Plan pursuant to which, if library and city officials have their way, will involve the irreversible demolition of the 42nd Street Central Reference Library’s famed research stacks before Mayor Bloomberg leaves office. The proposed sale-for-shrinkage of the Brooklyn Heights library almost exactly replicates the sale-for-shrinkage of Donnell (where a 50-story luxury hotel and condominium residence building is now under construction) even though that transaction is much reviled by the public. 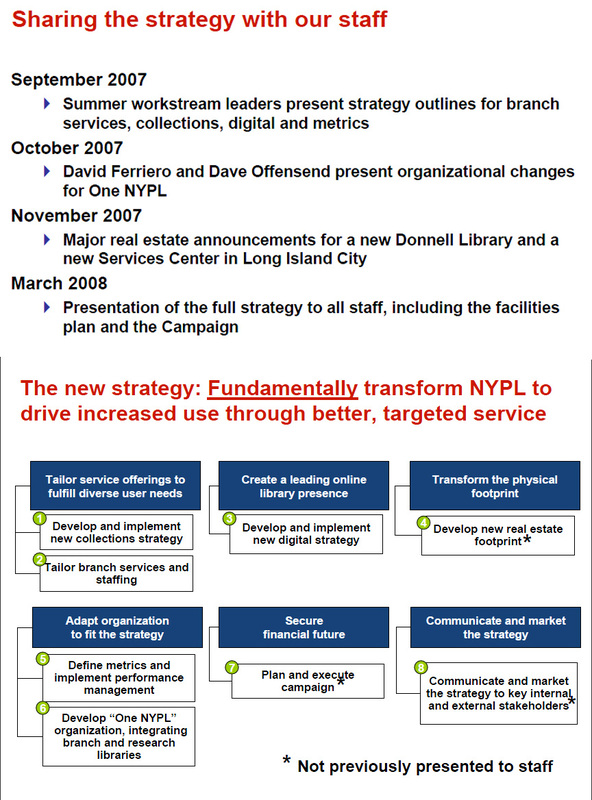 Two slides, top and bottom, from NYPL March 2008 staff briefing on new NYPL real estate strategies. Note Dave Offensend mention for October 2007 and asterisks about what was not previously disclosed to staff. Mr. Offensend is also a former president of the Brooklyn Heights Association. Talking about the shock that the Brooklyn Heights Association is not taking a stand against the sale and shrinkage of the Brooklyn Heights library is where we began. Another slide from the March 2008 presentation. Note the technospeak, "Provide better service to users through fewer service points". Ms. Hallen has recently been talking about the Friends having a big gala event that will involve a significantly different level of opulence than applied to the organization in all the years of its prior, tidy, simpler existence. In theory there is money coming for such an event from somewhere, but the originally scheduled spring date for the gala has been postponed and it is now planned for sometime closer to the signing of the contract certain people want to see to transfer the library to a developer before Bloomberg leaves office. What does all this mean? It will no doubt become clearer as additional facts are emerge and are sorted out. Some coincidences in the world are just coincidences but these coincidences should at least cause us to think about things that are worthwhile to think about. One of the most important to consider: Why, when so many people agree that the Donnell library sale was so disastrously conceived and executed, should we now be replicating that transaction so closely with the rushed sale of the Brooklyn Heights library? As stated at the beginning of this post, the Friends of the Library group rag-tagging under the dictatorial Hallen is a very awkward fig leaf for the Brooklyn Heights Association to be hiding behind. That’s especially true as Ms. Hallen, who seems to be bludgeoning her trustees with misinformation and threats, may not even have succeeded in getting them to vote in favor of her position that they should let the library be sold and shrunk. Bringing it full circle: Not only is the BHA hiding behind the Friends group, Ms. Hallen is also encouraging the Friends group, in round robin fashion, to think that they can take comfort in their association with the BHA. Stressing the linakge of the BHA and Friends positions, Hallen writes: “The BHA is a much larger force than we.” Safety in numbers? : It’s an ironic argument when it comes to this shrinking Friends group. Now it turns out the views once thought to have been ensured by such careful negotiation by the Brooklyn Heights Association soon stand to be lost. As one more of the many gifts Mayor Bloomberg intends to bestow upon the real estate industry before he leave office (which critics are referring to as a fire sale), Bloomberg and his administration are implementing a plan proposed by Vishaan Chakrabarti, the head of the Center for Urban Real Estate at Columbia University, to landfill and connect Governors Island to Lower Manhattan. 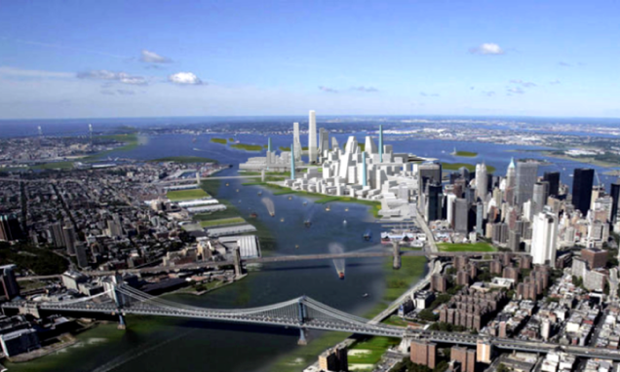 See: The Brian Lehrer Show, LoLo: Imagining New New York, Wednesday, December 14, 2011 and New York Times, Visions of a Development Rising From the Sea, by Julie Satow, November 22, 2011. Click below to hear what is planned to be implemented discussed on the Brian Leher show. 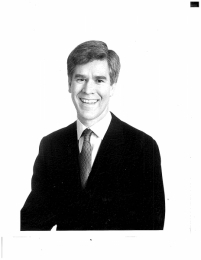 an executive vice president at the Related Companies, the large developer, where he helped oversee the Hudson Yards project and the redevelopment of Moynihan Station. He still serves as a consultant to the company and continues to advise on the projects. The Chakrabarti plan is viewed as a simple and logical extension of the New York City’s historic pattern of growth through landfill extensions of Manhattan. However, for reasons Mr. La Vorgna went on to explain, this is not being viewed as an extension of Manhattan to include Governors Island, but instead an extension of Governors Island to include Manhattan. The trustees of the Brooklyn Heights Association, however, have announced that they are quite chagrined that the views from Brooklyn Heights and the famous promenade will now involve seeing much less of an expanse of water and that tall towers will soon be crowding inward as the East River is constricted down to narrow northern extension of what is known as Buttermilk Channel, the waterway that now flows between Brooklyn and Governors Island. The zoning that will apply to the towers will be the new-stye, greater-density zoning being implementing around the city, similar to the Mid-town rezoning Bloomberg wants to put through, also before his term is out. The Mid-town rezoing will permitted density in a swath around Grand Central Terminal that will be nearly double what is there now. 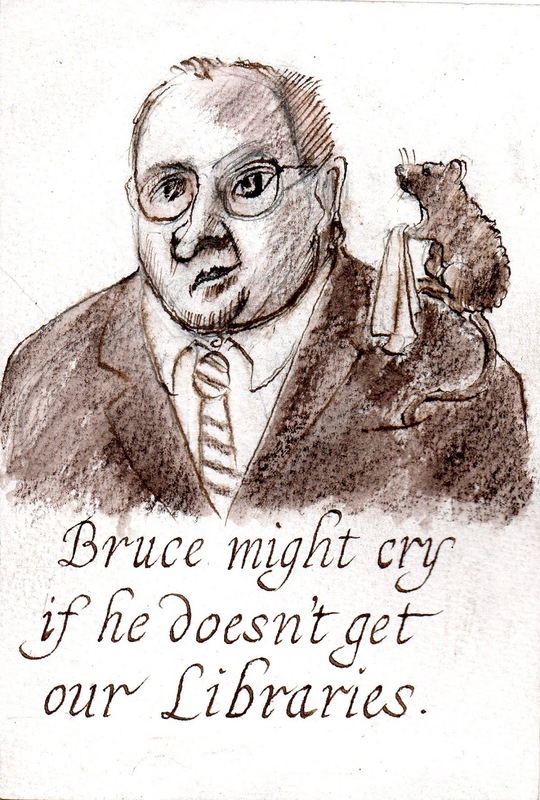 The BHA trustees sad that they had been aware that the Bloomberg administration has been engineering a number of give-aways to the real estate industry on its way out, including the: sales and shrinkage of the library system’s assets, sale of schools to developers and, similarly, the sale of the public housing playgrounds as sites for luxury housing. 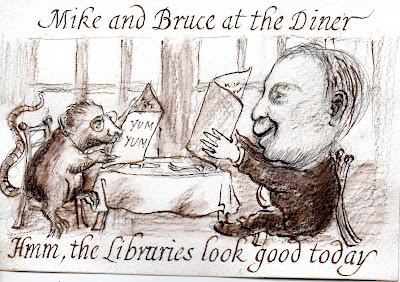 Nevertheless, their spokesman said while the BHA trustees were not opposing these things, not even the sale and shrinkage of the Brooklyn Heights library with the underfunding of the entire library system as a prelude to that, they had not expected that Bloomberg would be taking any action in his give-aways that would affect anything that they actually cared about. This new move by Bloomberg, they said, was truly shocking. In the fall of 2011 the Times said that the major impediment to the project was “there are strict regulations on building with landfill.” That problem has been neatly sidestepped, obviated by clever engineering by Bloomberg officials during the waning days of Governor Paterson’s administration when, in a little-noticed maneuver, Bloomberg was handed exclusive jurisdiction over both Governors Island and Brooklyn Bridge Park, using a structure the interposes Bloomberg owned and controlled corporations created by the Empire State Development Corporation. 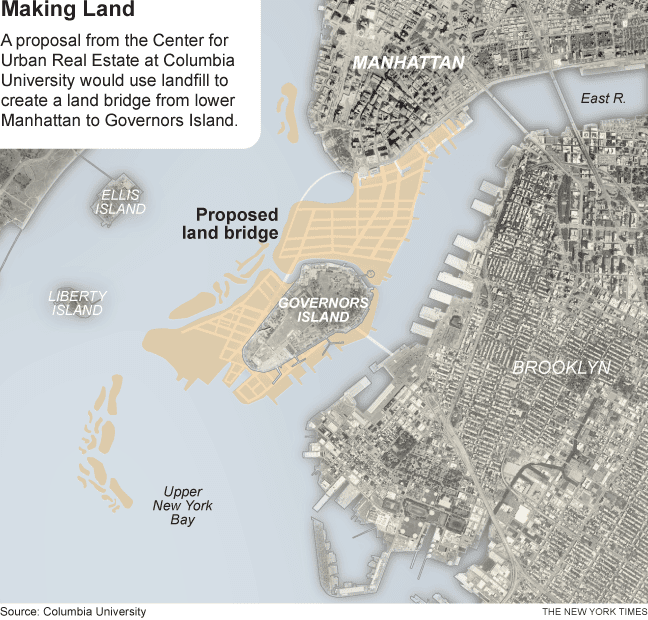 This gives Bloomberg the power to proceed without any involvement from the City Council. It also invokes all of ESDC’s exemptions from zoning and any such troubling regulations. 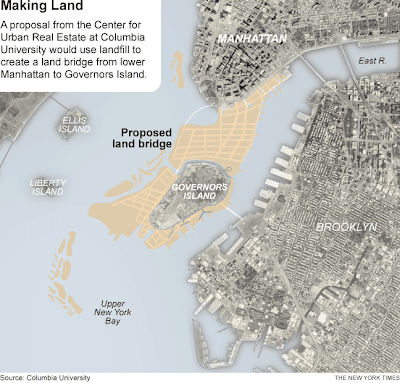 It is for this reason that Bloomberg is proceeding with this project as an expansion of Governors Island and not Manhattan. Bloomberg released a statement disclosing that he has a legal opinion joined in by both the City’s Corporate Counsel’s office and lawyers from Bloomberg, L.P. that any part of the expanded Governors Island will be under Bloomberg’s corporate control. The opinion says that when landfill makes the final connecting link to Manhattan, so that the circumference of Governors Island can be described as including that island too, Bloomberg’s jurisdictional control can be considered to expand accordingly. 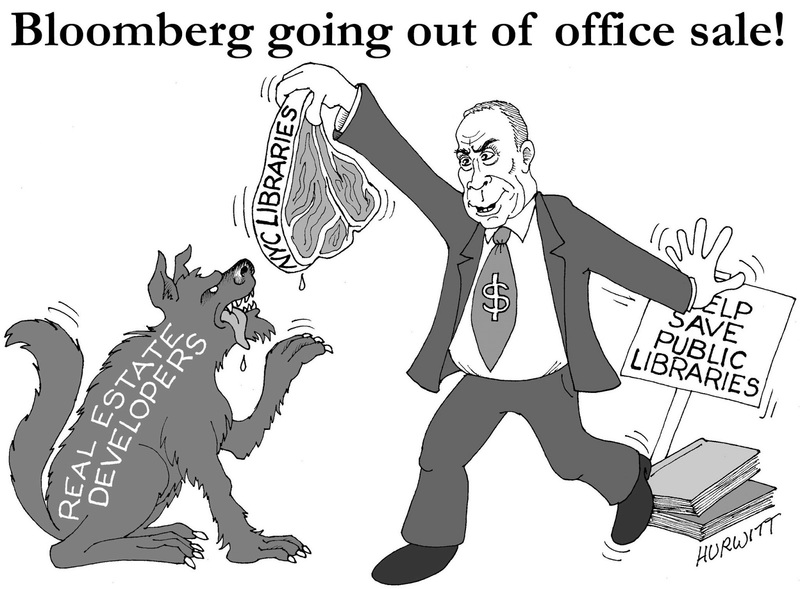 The opinion also indicates that the authority will be personal to Bloomberg rather than residing in the office of mayor. Otherwise unprepared and unmobilized to fend off such a previously unenvisioned eventuality, the coalition of Brooklyn community groups represented by Brooklyn Speaks and Develop Don’t Destroy Brooklyn ventured, ad hoc, to speak for Brooklyn residents on this matter as well, even though that was not the purpose for which their coalitions were originally formed. “This is another arrogant land grab!” they said in a hastily prepared joint press release. The proposal presents extreme engineering challenges but these have been thought through and anticipated by the Bloomberg administration. The new land bridge would divert 11,375,177,142 gallons per hour from the shipping channel, about 11.4 billion gallons per hour diverted into the already 3 knot flow of Buttermilk Channel. Before the land bridge was completed a sizable portion of that immense flow would be flowing through the current shipping channel that the land bridge would be in the process of damning up as it was filled. In addition, an extension of subway service would have to flow to Governors Island and the new land with the new subway tunnel challenged by this immense fast flow. If the fast-flowing waters washed away silt, unburying the subway tunnels there is danger the buoyant tunnels could float to the surface. Things might be especially precarious in the event of another storm with strong tides like Superstorm Sandy. 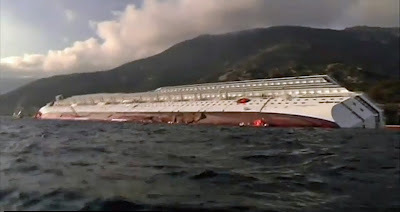 Part of the inspired engineering answer is that Bloomberg administration is buying the salvaged hulk of the Costa Condordia, the Italian cruise ship that ran aground at Isola del Giglio, Tuscany, on January 13, 2012. New tunnels will be run through the ship’s body. Meanwhile, a world-wide surplus of shipping tankers has tremendously reduced the cost of adding other ships to the chain. Bloomberg says, however, he may be thinking bigger than that. He noted that the recently built Oasis of the Seas is five times the size of the Titanic and that it was built to give its 6,300 passengers the opportunity of having “a Coney Island kind of experience” with a “boardwalk” neighborhood with an ice cream shop, a doughnut shop, a life-size carousel with horses and tigers and rabbits, all of which were hand-carved for the ship. The Coney Island area of the large ship may actually be larger than the original Coney Island that the Bloomberg administration has shrunken down. 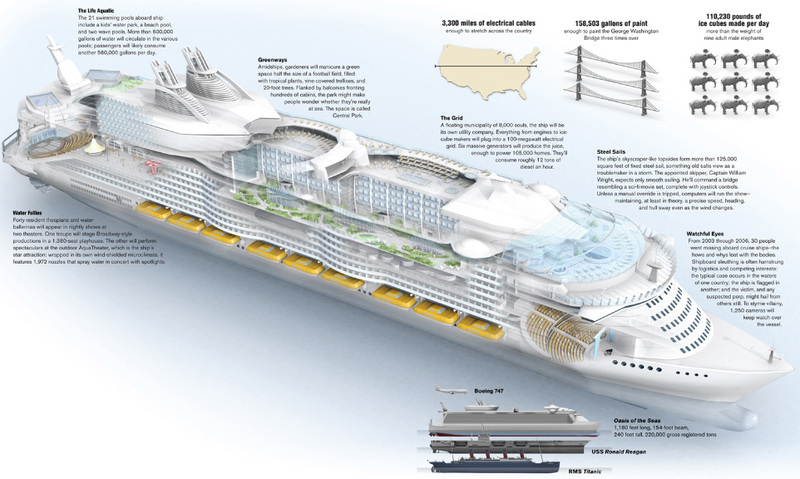 The final thing noted in the press release was that almost all cruise ships have small libraries. The Bloomberg administration might keep some of these libraries in place and functional as a replacement for the libraries it is selling throughout the city, including the Central Reference Library behind the lions Patience and Fortitude at 42nd Street in Manhattan where Bloomberg wants to rip out the research stacks this summer in furtherance of the planned sell-off of real estate to developer beneficiaries. Given what things have come to in this city as we arrive at this first day of this spring month, what is truly extraordinary is that so much of what was once might have been presumed to be fanciful is actually absolutely true. Check it out using the links supplied.